Manager Ron Atkinson indtil 5. november 1986. Manager Alex Ferguson 6. november 1986. 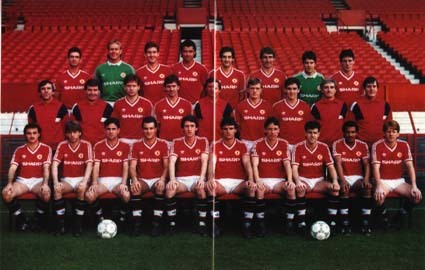 Front row: T Gibson, J Olsen, A Albiston, C Blackmore, P Davenport, K Moran, M Duxbury, C Gibson, R Moses and G Strachan.